I don’t like to cook all the time. I’m only human. When it comes to making something special, I really enjoy cooking. It’s those everyday family meals that are not so much fun. I’ve learned a few tricks to make it less painful that I’d like to share. Here’s what I did last week that worked well for me. Cooking Meat in Bulk for the Freezer: My husband brought home a value pack of chicken breasts–yes, I’m lucky enough that he does all the grocery shopping. That night I cooked all of them on the stove using a braising method. It took two big skillets, but the cooking time was the same as if I’d been cooking chicken for just one meal. I put a little love oil in each skillet & then after about 10 minutes I added a little water and covered the skillets for some low-to-medium heat braising. This braising method seems to keep the chicken tender and juicy. The chicken released quite a bit of water after a while, so there was no problem with burning. As the chicken got tender, I used 2 forks to pull apart the bigger pieces into strips. This helps the chicken to finish cooking quicker and puts the meat in the sizes I want for recipes. All the while the chicken was cooking I had plenty of time to unload and load the dishwasher as well as do a little cleaning in the kitchen. Since I was in the kitchen it was easy for me to check the chicken fairly often. 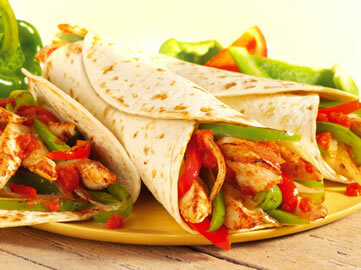 Easy Dinner #1: I used some of the cooked chicken strips to make fajitas. I just added onions and green peppers, and a few shakes of taco seasoning into the skillet with the amount of chicken for the fajitas. (I put all the rest of the chicken strips into the other skillet to finish cooking.) In no time, it was all hot and ready to serve. We each made our own fajitas adding, cheese, salsa or chopped tomatoes, hot pepper flakes, etc. It was easy for me to get these toppings ready while the chicken was cooking. Easy Dinner #2: The next night I cooked some rice (could be done several days ahead also) and made a simple stir-fry with chicken strips and a bag of frozen stir-fry vegetables. We love this. Easy Dinner #3: Same at dinner #2. My husband loves stir fry and doesn’t mind eating the same thing 2 nights in a row. Since this meal just needs to be reheated in the microwave, it’s great for a night when you have no time to cook. If you do have time to cook, you can get a start on the next night’s meal by making one of the items you plan to serve. For example you could wash and chop vegetables for the next night. Or make a salad to go with tonight’s dinner. When all the chicken strips were cooked the first night, I let them cool while we ate our fajitas. When they were cool, all I had to do was put the strips into freezer containers. Since the strips fit easily into the containers, it saves space in the freezer over freezing uncooked chicken. It didn’t take much time at all to put the cooled strips in the containers. Altogether we got 9 meals worth of chicken strips, but that’s just for the two of us. How to Get Variety in Your Meals: Nobody wants to eat chicken all the time! At this point, we have 3 containers of cooked chicken strips in the freezer with many possibilities. The chicken can go into many casseroles, soups, all kinds of Tex-Mex recipes, stir fry dishes, barbecue sandwiches, other chicken sandwiches, and pizza, to name a few. All of those meals can be pulled together so much more quickly with the chicken ready to go. You also can cook a beef roast or pork roast and freeze the meat in slices or shreds for the type of dishes you make. Cook up ground beef that you break up and cook “loose.” After it’s done, cover it with hot water and continue cooking a a little longer. That way when you remove the beef crumbles, much of the fat will stay behind in the water. Great for adding to spaghetti sauce, making tacos, chili, etc. Be sure to label and date all the containers of cooked meat in the freezer. After doing this for a while you will have a good variety to choose from. Depending on what you are making, you can even use frozen meat as a head start on entertaining. I think this is a real time saver and cuts way down on the amount of work you need to do to put a meal on the table. I always try to make enough of one item at a meal that can be used in another meal, whether that’s rice or a vegetable. Just having part of a meal already done makes it easier to start a meal. Psychologically, it’s a boost! Some people call that leftovers; I call it smart. It saves time and makes your life easier. Try it; you’ll like the simplicity of it!